Not nearly as important as that movie I reviewed the other day; but fun. 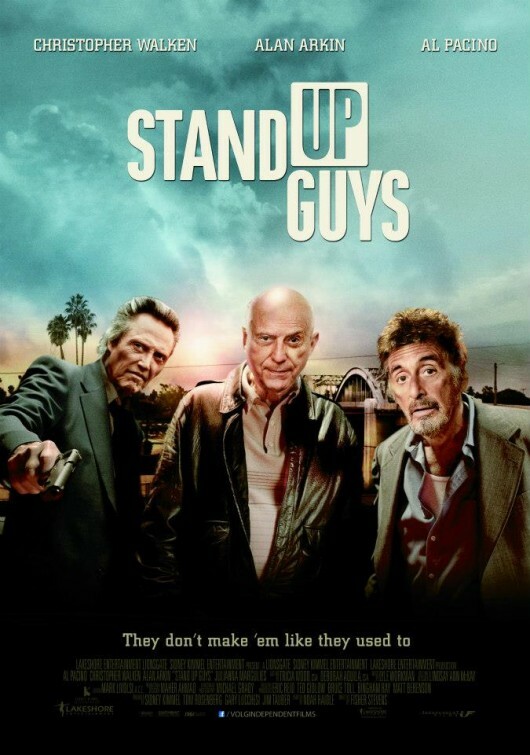 Al Pacino, Christopher Walken and Alan Arkin are three retired gangsters who reunite in their old age. Val (Pacino) has just gotten out of prison after twenty-eight years when Doc (Walken) goes to pick him up; they later liberate Hirsch (Arkin) from a nursing home and go out on the town, raise a little hell, do a little bad-guy justice. The whole movie covers about 24 hours, in which we enjoy jokes, gruff man-love, joy and death: it’s about what you’d expect from the cast. Predictable though it may be, I found this sentimental, elegiac, man’s-man end-of-life tale to be thoroughly entertaining. I was reminded of Tarantino: the script is equally, self-consciously funny (hello, Viagra jokes) and off-color, and violent. Not quite so quotable, though, and indeed, Tarantino does not appear to have been involved (though according to the Google, I was not the first one to wonder). For Tarantino fans – or fans of Walken et al! – I think Stand Up Guys is good fun.